When first laid, with a tunnel in the making. ......and so it's watch this space or rather the garden in spring. In the immortal words of the man trapped on a boggy moor.... "you silly sod"
Such a shame. It does give the chance to change or implement new ideas though! End2end wrote: In the immortal words of the man trapped on a boggy moor.... "you silly sod"
Thanks for your concern and comforting words. I think actually taking everything into account It may be a case of a more simplified circuit. Can I ask what your track is lying on now? I used two main sub-structures: for a straight embanked stretch, square section drain pipe (2 wide) propped at 2ft intervals and then the embankment pushed in to stabilise it. Elsewhere stamped earth, levelled with sand topped with twin-wall polycarb sheeting. about 6y" wide for a single track. It's proven stable, but it's very easy to adjust by packing sand in or scraping it out. Only on one curve did I find it worth adding stakes inside the curve, wired to the sleepers at intervals to stop "drift" outwards. My track is G, scale 1:22.50, gauge 45mm, approximately 3½ inches and laid on concrete. I am not sure yet how we will doing it but the pipe definitely gives food for thought. 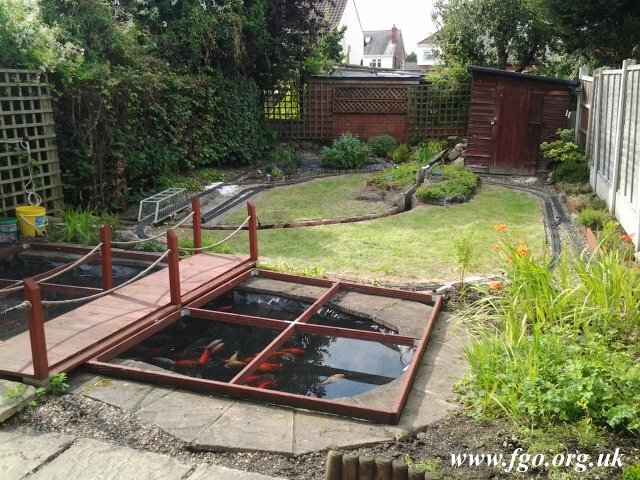 This is the current layout taken a few years ago when making some slight change to the sidings and the pond. Lancastrian wrote: Thanks for your concern and comforting words. Thats a great bridge and some lovely Koi too! Thanks, the bridge was made by my son and only cost £8.00 and that was for a box of spokes from the bike shop, the main frame was made from the aluminium frames of some folding doors I threw out. I actually meant the bridge over the pond, but that's a great railway bridge too! Great work Chris. End2end wrote: I actually meant the bridge over the pond, but that's a great railway bridge too! Great work Chris. Oh sorry, that was also made by Chris but of course I had to supervise. This picture shows more clearly, bottom right, the section that I mangled up. Lancastrian wrote: This picture shows more clearly, bottom right, the section that I mangled up. Interesting: relative to the track the grass wants to be either higher or lower. If the edge dips down, cutting in from the edge for a turf "flap" that could be raised with infill soil/compost could be an easy way in. If on concrete dropping the track isn't really an option. An alternate to raising the track, (if the ground is firm) something like spaced round metal tent-pegs? for a guess 5-6mm rod, about 200 mm long, each? Could be joined by wire for a fence (the loop on the railway side. ) High enough to stop the flymo but room to be clear of the trains? Otherwise it's raising the track to make an embankment with some sort of lawn-edging to stop the mower. If there's a decent lazy way, that's the one I want. 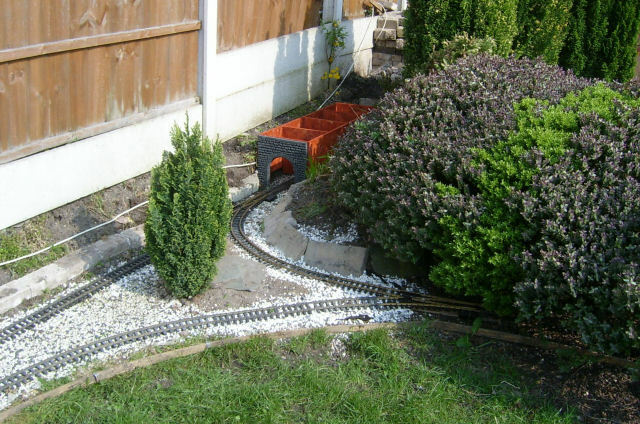 This is an old photograph Chris, but we do plan to raise the track, not sure how much though and re-organise the garden but not sure yet what we (I really mean Chris, although I will help) intends to do. The problem is I am not getting any younger and have to consider not least bending and general garden maintenance. The easy option is one that we definitely be taking though. This is why the garden clinched my house to me. The lower level is 3-4 ft higher than the path next to the house. Near perfect. In my former town house I just had a fairly small bare yard so I had brick raised beds put in, having designed them so that they would work *without* the trains for any new buyer. An unusual but very interesting set up Chris, I like it.